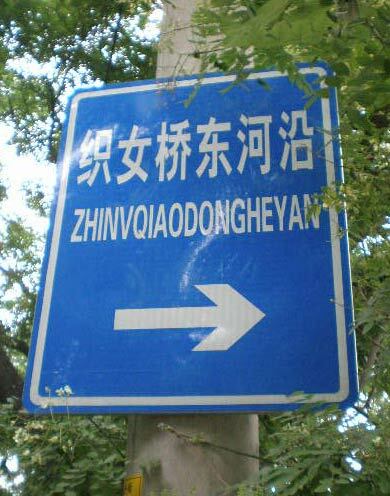 This entry was posted in Beijing, China, Chinese, computers, Hanyu, Mandarin, pinyin, romanization, signage, software and tagged umlaut by Pinyin Info. Bookmark the permalink. For nue or lue you might tell it to the LoC people. And I just found the same error in “Guide to transliterated Chinese in the modern Peking dialect” by Ireneus László Legeza. @Christoph: Nice blog! It’s good to know I’m not the only person in the world interested in such things. Oh, don’t get me started on the Library of Congress. The LoC completely abdicated its responsibility to apply word parsing; and it doesn’t understand Pinyin’s apostrophe use either. Still, it’s not necessary an error to list some spellings, as there are all sorts of variant sounds on the edges of standard Mandarin. But the LoC’s and Legeza’s use of “nue” for Wade-Giles’ “nüeh” does strike me as incorrect, unless this is instead a quirk in Hanyu Pinyin that I’m not familiar with. Well, I’ll be happy if someone comes up with some more info on the nue, lue thing. I want to support well known, de facto standards. I just implemented/improved a Wade-Giles parser which took me a whole weekend just to make sure I get all the different cases with or without diacritics, initials, apostrophes… Seems Pinyin is pretty similar on non-standard usage. Why wouldn’t it be “Zh?n? Qiáo d?ng héyàn”? In addition to being pronounced that way by Beijingers, my dictionary distinguishes “? yán” (“along”; “follow; trim”) from “? yàn” (“water’s edge; bank”). This seems to exemplify one of the difficulties of replacing Chinese characters with pinyin, not to mention the obstacles to standardizing spoken Chinese. I had to deal with this since my wife’s name is ?? lv3li4. I had originally told my family to spell her name Lvli. Our marriage certificate was officially translated as Luli, with no umlaut. I went back and had them change it to Lvli. Unfortunately her passport was made as Lu Li, so no chance of changing that. I am now of the belief that Lu Li is the proper way to write this. Why? Those three reasons are enough for me to use the practical solution of ‘u’ rather than the more accurate solution of ‘v’. Pingback: Pinyin news » Pinyin’s never-used letter? I think that the letter v should replace ü altogether (assuming we can add the four ASCII characters necessary for a toned v group). Aside from the fact that v is easier to type, would remove all non-tonal diacritics, and fill in the alphabetic gap (while removing the one letter not used in the English alphabet), the actual shape of “v” looks like a narrowed “u,” which is precisely what this vowel sounds like. Thus, I don’t think that replacing ü with v would cause much trouble at all. At the very least, it could be used for the lu/lv and nu/nv distinctions, while words like xue or ju could remain unambiguously the same.